Menu printing in Las Vegas has never been easier! Advertise your culinary selection in an appetizing format that people will enjoy perusing! With full color menu printing, you can showcase your best dishes and give your customers the lowdown on the different flavors you provide. With a topic so delicious, you will want to create a menu design that is a feast for their eyes! Vivid 4-color printing will help you bring the food to life and increase the appetite of anyone who visits your cafe, restaurant, eatery or establishment. 100% customer satisfaction guarantee so you can stay confident that your designs will be delivered with the perfection you envisioned! Choose from a variety of custom options including different standard sizes, folds, menu covers, and paper types! Protect your custom menu printing from messy food with aqueous or high gloss UV coatings. Easily upload your menu file and it will be printed within 2 to 4 days. 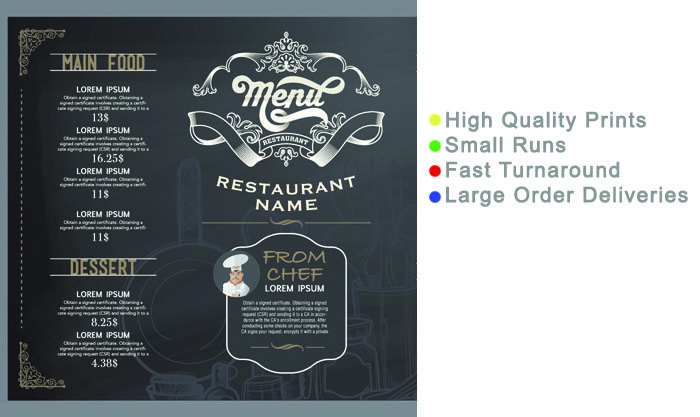 Many companies prefer short-run menu printing services because it is more cost-effective to produce just what you need. Check out our competitive printing prices or call 702-303-5951 today for a custom quote.